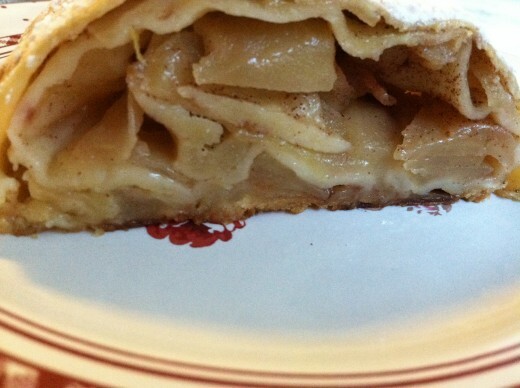 A butter shortage and lack of desire to stand over a hot stove frying apple pies all night led to the creation of my first apple strudel. If any local people come looking for fried pies tomorrow at the market, sorry. We’ve got the German version. It was so easy to make that I’m kicking myself for not trying it even once in the 30+yrs. that I’ve been a bake-a-holic. I converted, halved, added to, and flipped on its head a recipe I found in a foreign magazine the other day. I don’t even remember which, because I just quickly snapped a pic. 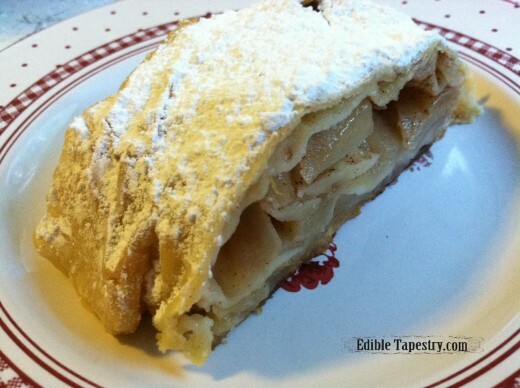 with my phone in case I ever felt like getting around to strudel making. Who knew it would be two days later? Anyway, I butchered the recipe so badly, mainly because I’m such a poor mathematician, that it took a few tries to get a workable dough made. I’m very happy with the end result, however. I didn’t follow the rules with the filling either. Just sprinkled away and rolled it all up. But then I forgot to lay it on parchment paper. Remembering last week’s chocolate biscotti disaster over something so basic, I quickly finagled the entire strudel onto a sheet after I’d already managed to get it transferred to the baking pan. My measurements are a little weird, but they work. 1/2 c. warm water, give or take a little, depending on how much liquid your egg contributes. Lay a sheet of parchment paper over a sheet pan. 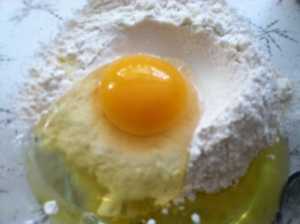 Combine the flour and salt. Mix in the oil and egg. 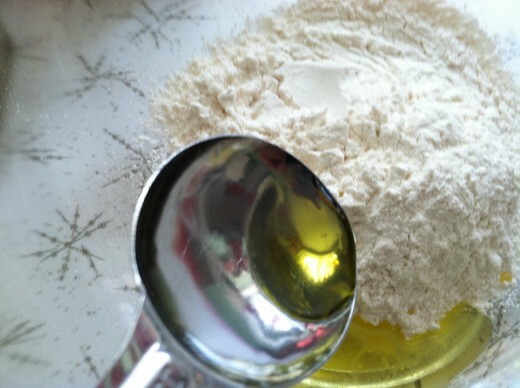 Drizzle in the water while mixing until a smooth, soft dough is formed. 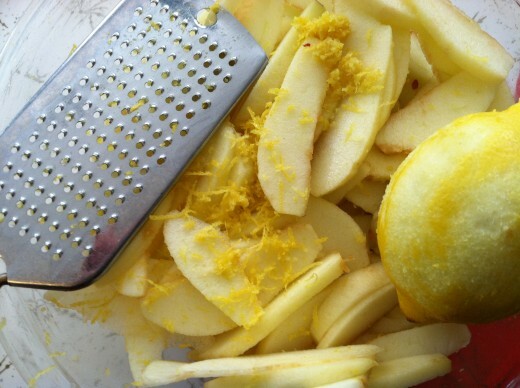 Add the apples to the lemon juice and rind and toss to prevent browning. 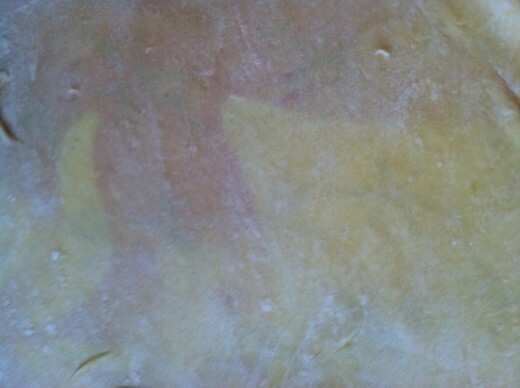 Roll out the dough on a well-floured surface until it’s so thin you can see through it. 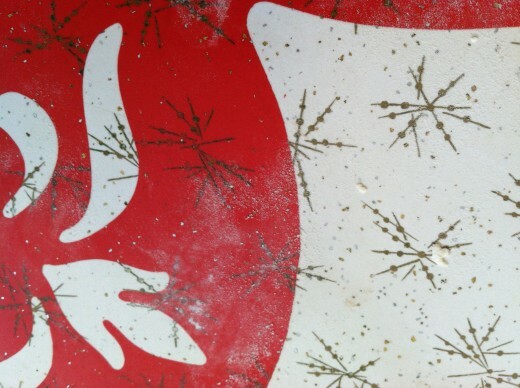 I used the pattern on my red ’50s table as a guide. The dough was silky soft and rolled right out. Brush the butter onto the dough. 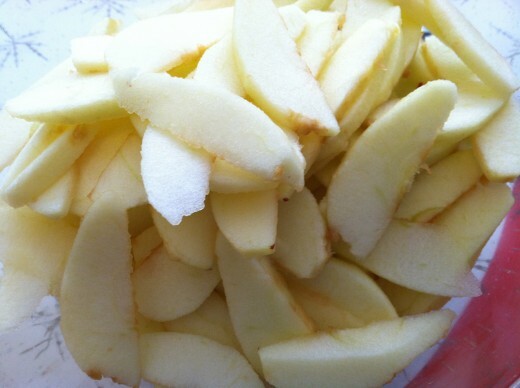 Lay out the apples. 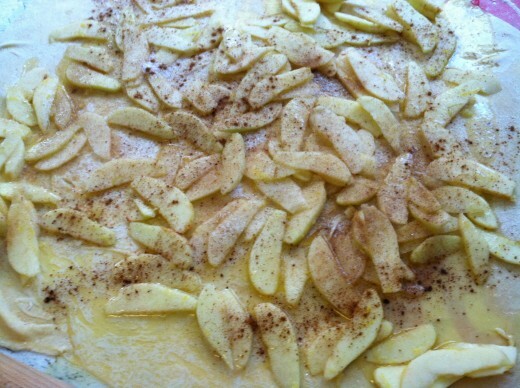 Sprinkle them with the sugar and cinnamon. 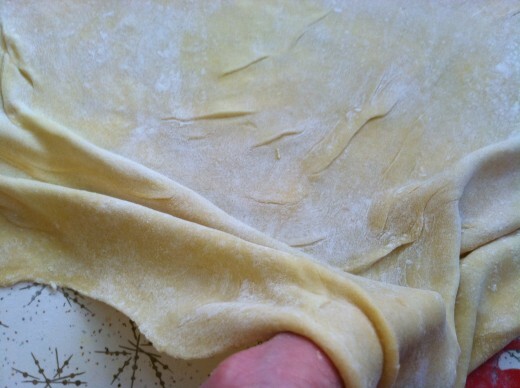 Carefully roll up the dough and filling. 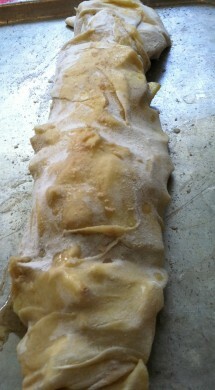 Even more carefully transfer the whole roll to the parchment paper. 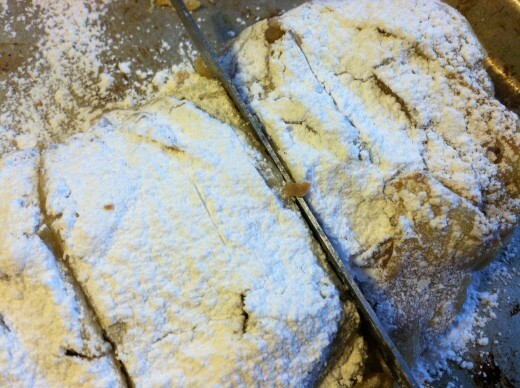 Sprinkle with confectioner’s sugar before slicing and serving. 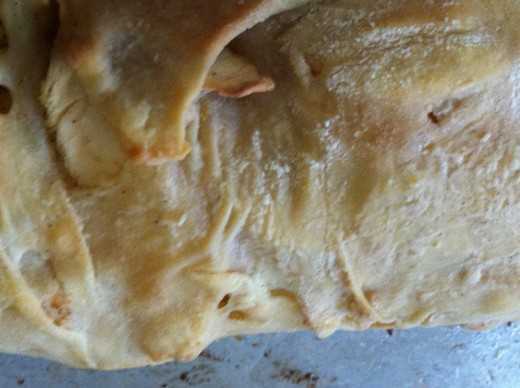 Use a very good serrated bread knife to gently saw through the dough layers without crumbling them.